However, although there is a down arrow present, you cannot shrink the disk in this way, it's not supported. 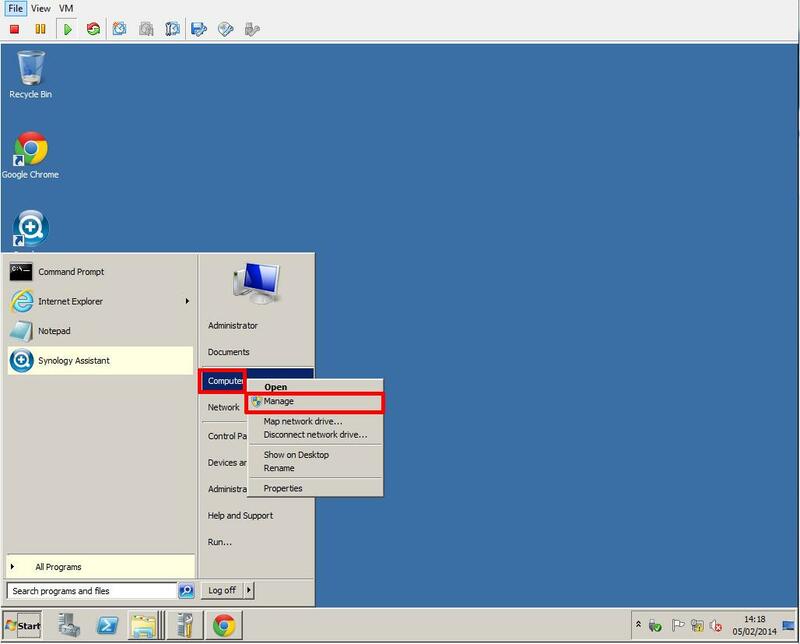 The only supported method of shrinking a VMware virtual machine disk (VMDK) is to use VMware vCenter Converter Standalone and create a virtual to virtual (V2V) conversion, a similar process to a Physical to Virtual (P2V) conversion. V2V Conversions can be slow. 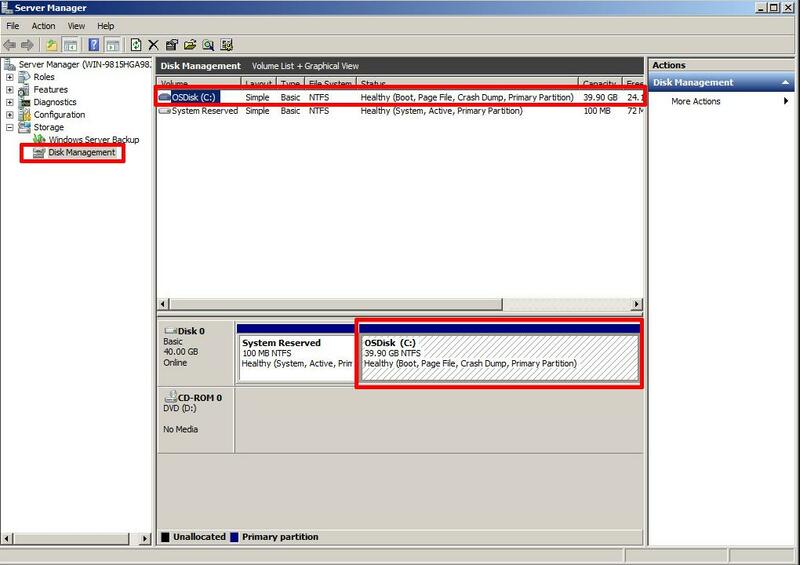 You need to ensure, you have enough datastore storage space for the new virtual machine disk. The virtual machine is converted, so there is a small risk, the conversion can cause issues with the converted virtual machine. The converted machine can contain a different MAC address. V2V are prone to failure. Support end-user method of re-sizing a virtual machine disk. After reading and understanding this article, you will be able to reduce the size of virtual machine disks in less than five minutes. I will let the reader decide if this is a faster method than the traditional practice of using a V2V, to change the size of a VMware Virtual Machine Disk (VMDK). On occasion we come across an installation, where an Administrator has assigned a 2TB virtual disk, and does not have the space to create a V2V! I feel this is a little more advanced, so I've not included it in the Basic VMware article series. Before your start the following procedure, please ensure you have a valid and tested Full Backup of your virtual machine. This does not mean a VMware Snapshot. Shrink the Operating System partition - This is covered in Step 1. Using an RDP (Remote Desktop Protocol) connection or connect via the Console, using the vSphere Client, login to the virtual machine as an Administrator. Press Control-Alt-Delete to login to the virtual machine. 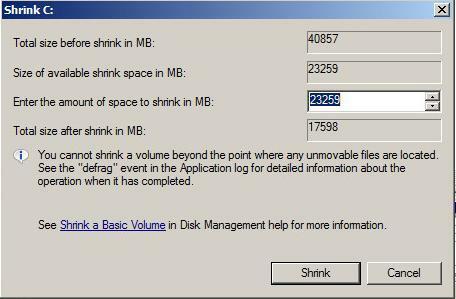 Select Disk Management, and select the partition you need to shrink. Right Click the Volume/Partition to shrink, and select Shrink. The above dialogue will briefly appear whilst the file system is queried. the above dialogue will appear. Enter a size to reduce the OS partition. 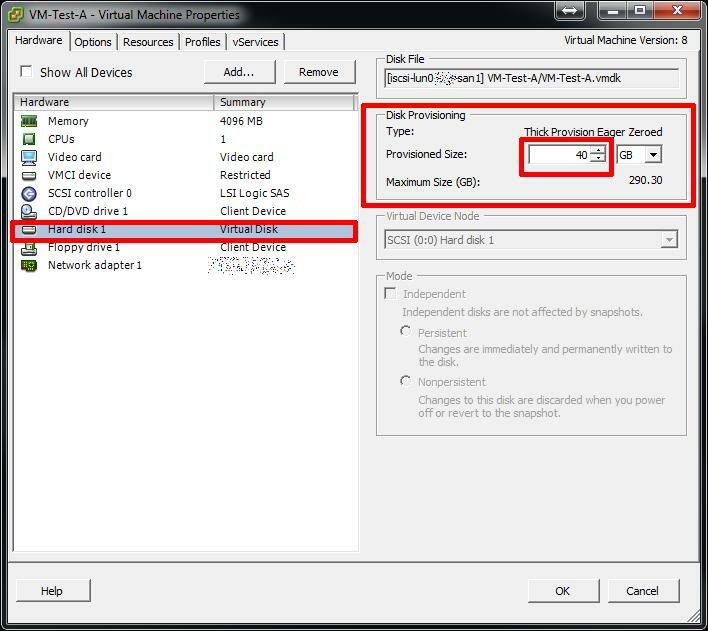 In this example the VMware virtual machine disk (VMDK) is 40GB, and we would like to reduce the size of the VMware virtual machine disk (VMDK) to 20GB. The Disk Management utility scans the available file system, and reports a maximum size the OS partition can be reduce by, this is based on current file system usage. 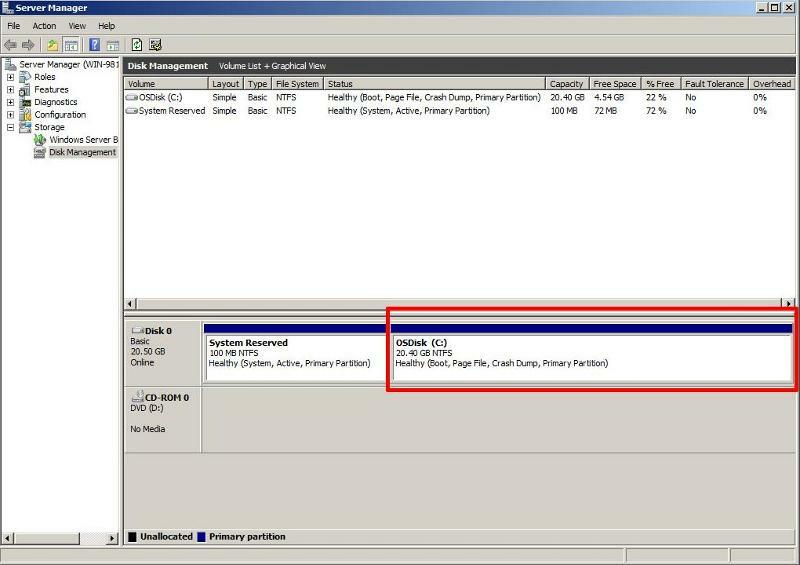 OS Partition size after Shrink Operation. 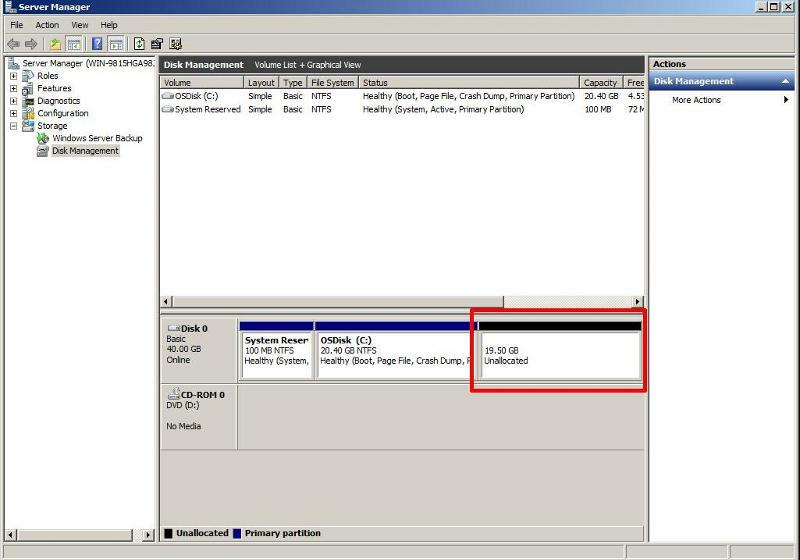 As can be clearly seen in the above screenshot, there is now an unallocated 19.5GB space on the virtual disk, in Step 2 the VMware virtual machine disk (VMDK) will be "chopped", removing this unallocated storage space, and finally reducing the virtual machine disk (VMDK) to 20GB. Providing that we DO NOT affect the existing partitions, this is a safe operation. So in effect the "cut" will be made in the unallocated storage space, after the OS partition. Login and connect to the VMware vSphere Host ESXi server which hosts the virtual machine. 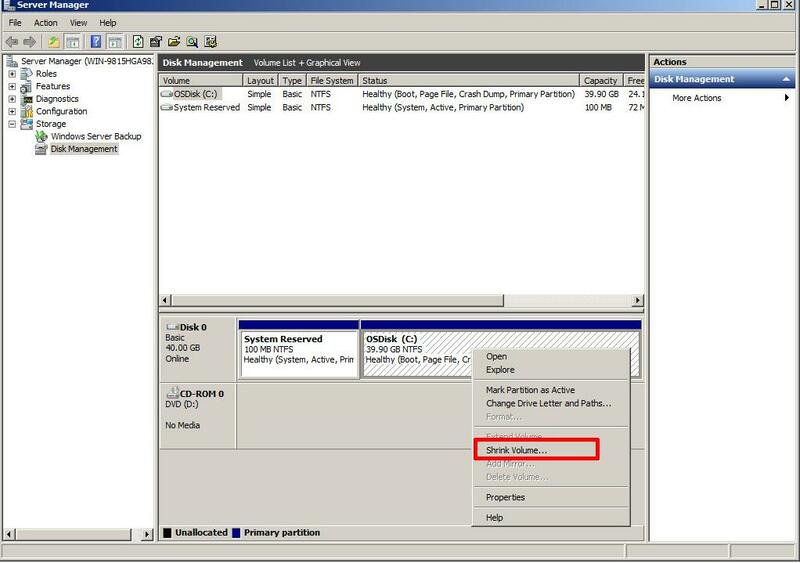 Power OFF the Virtual Machine, and change to the datastore path where the VMware virtual machine disk (VMDK) is located. Using vi, edit the descriptor file, and change the number from 83886080 to 41943040, and save the file. 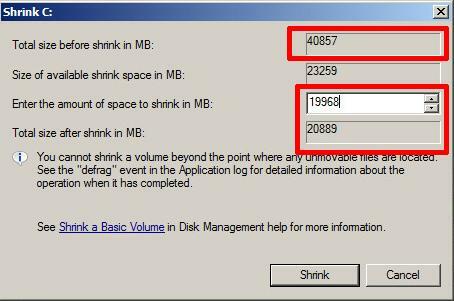 After the virtual machine disk (VMDK) has been moved, you will notice the disk size reflects the desired size of 20GB. After restarting the virtual machine, and checking with Disk Management, you will notice the 19.5GB unallocated storage space, has been removed, and disappeared.